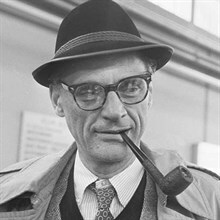 Arthur Miller (1915-2005) was born in New York City and studied at the University of Michigan. 2015 marked the centenary of his birth. His plays include The Man Who Had All the Luck (1944), All My Sons (1947), Death of A Salesman (1949), The Crucible (1953), A View From the Bridge and A Memory of Two Mondays (1955), After the Fall (1964), Incident at Vichy (1964), The Price (1968), The Creation of the World and Other Business (1972), The Archbishop's Ceiling (1977), The American Clock (1980), and Playing For Time (1980). His other works include Situation Normal…, a work of nonfiction (1994); Focus, a novel (1945); The Misfits, a screenplay (1961); and the texts for In Russia (1969), In the Country (1977), and Chinese Encounters (1979, three books in collaboration with his wife, the photographer Inge Morath. Among other honors, he received the Pulitzer Prize for Drama in 1949 for Death of a Salesman.